I got up early and wandered around the compound. 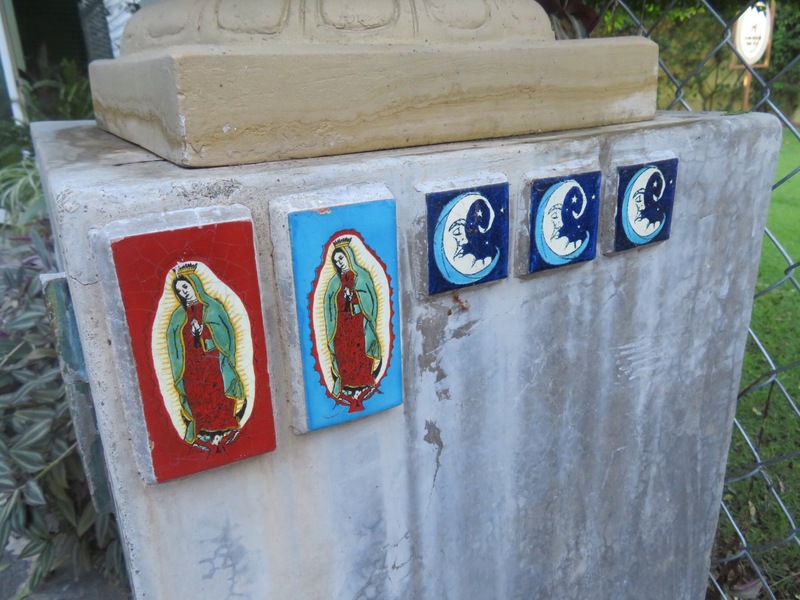 Lots of interesting niches and leafy hideaways to relax in. 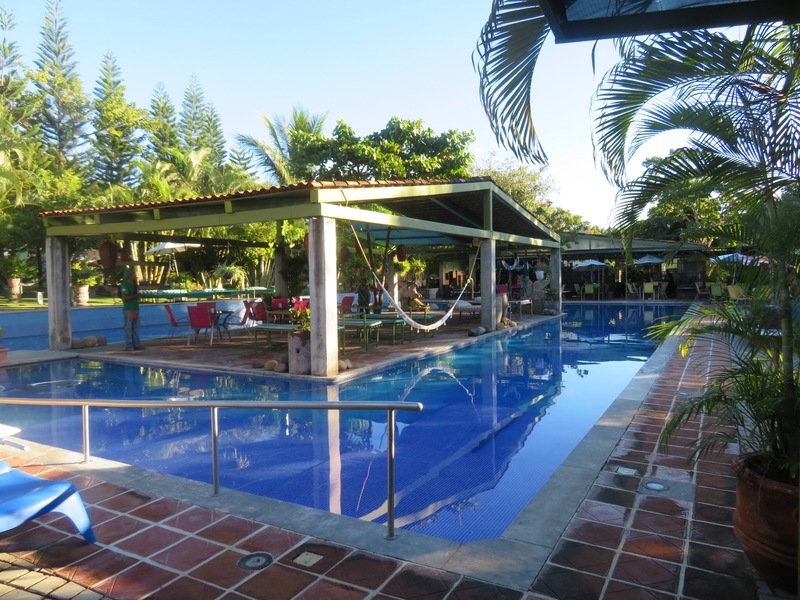 The bungalows are spread among the trees and arroyos of the property. 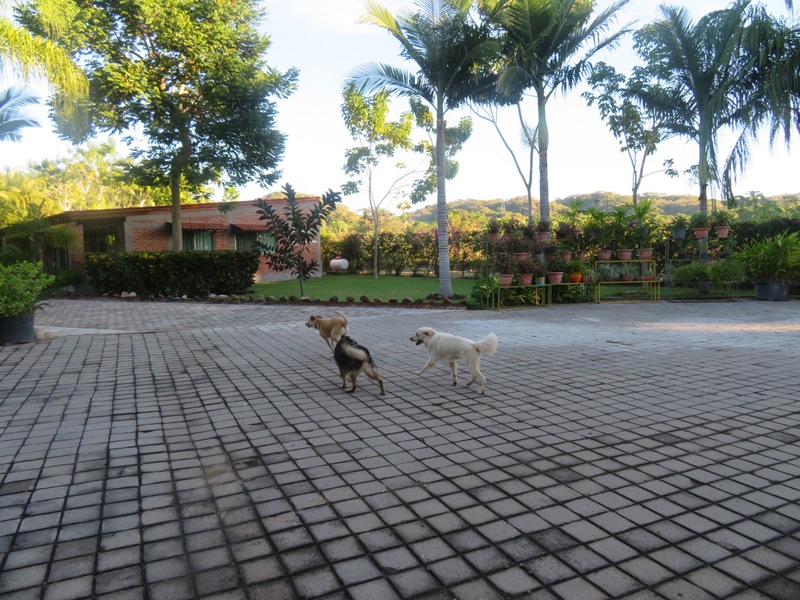 A number of dogs were roaming around the property. Russo, a white lab mix and Negra, a smaller black typical Mexican style mutt followed me over and met Cali and Koda. Negra wanted no part in the horseplay and beat feet, but Russo chased our dogs around until his play got a little too rough for Koda. We hitched up the dogs and took another tour of the campus with PJ. We could smell pancakes cooking at the restaurant and the pool was freshly cleaned and inviting. Unfortunately, I’m having some ear issues so better to stay out of the water. 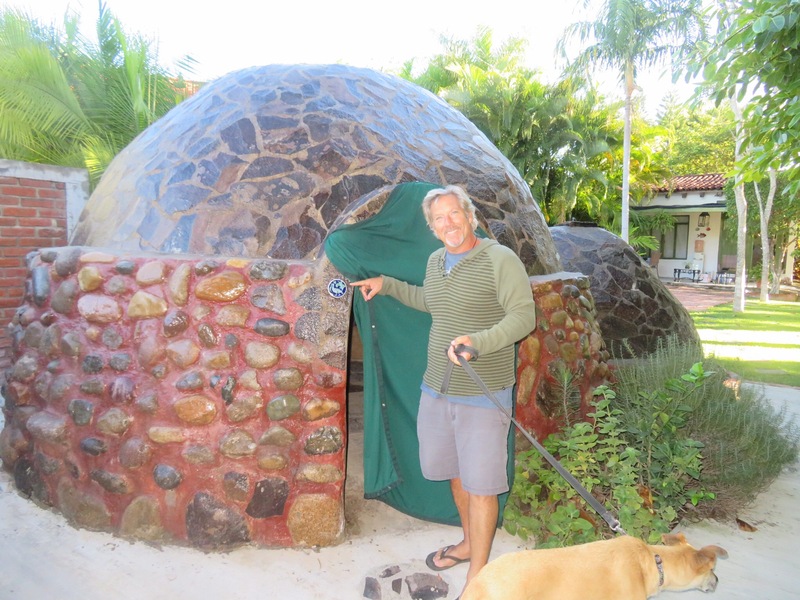 We walked through the arroyo and checked out the sweat lodge near the area behind the pool. 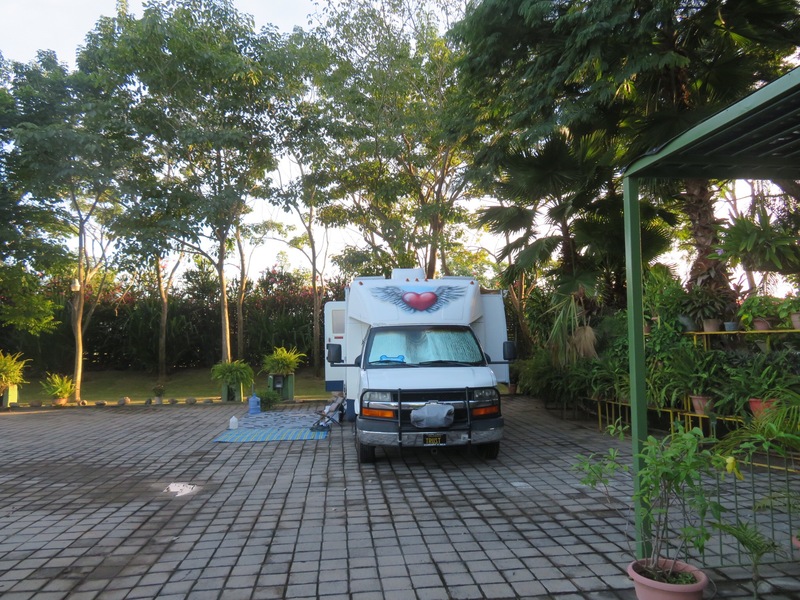 We peeked at a few of the casitas to see what they had to offer then went back to the RV where PJ set us up with some fruit and cereal at the little covered patio area by the motorhome. 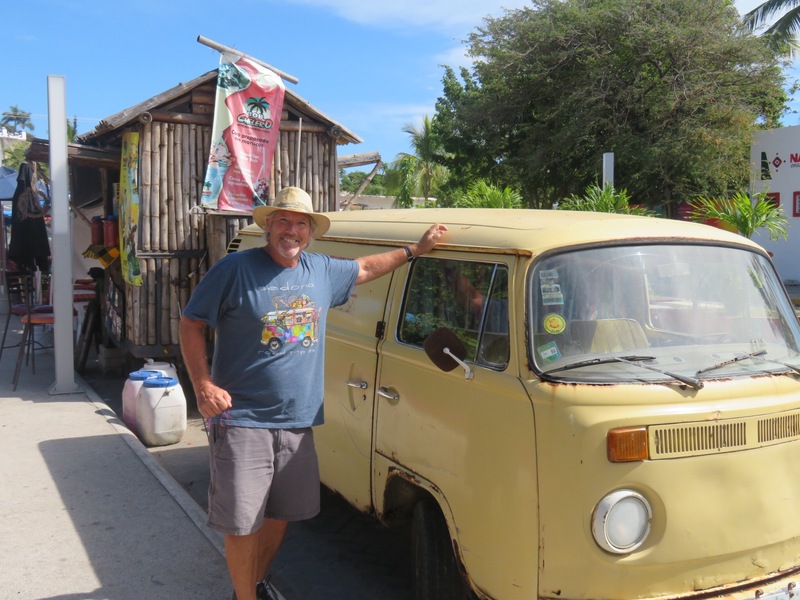 There was a shuttle going into Bucerias at noon, so we hopped on along with a French ex-pat named Andrea. 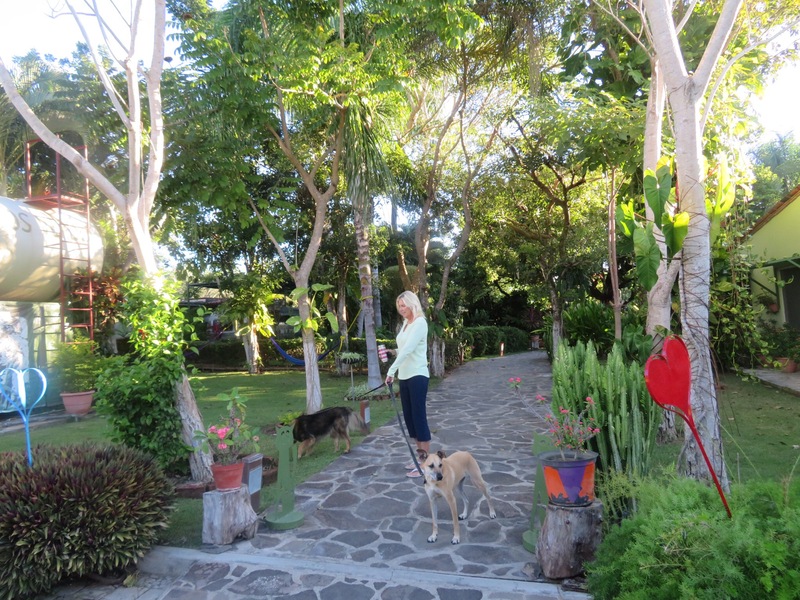 She has been living in Mexico long term and recently settled into one of the casitas here at Los Arroyos. She recommended a consultoria to get my ear checked. So after stopping to let me withdraw some pesos, our driver, Joaquin, dropped us at the doctor’s. Dr. Rosales was a young guy who I’m guessing is doing his internship manning the small office next to the pharmacy. He took a few vitals then looked into my ears with his little scope. He couldn’t get all of the way in because the inflammation had closed the canals and it was painful when he tried to push past the restriction. The right ear has liquid trapped and sometimes blocks all sound. I’m constantly jiggling the ear and poking at it to clear it so I can hear. The Dr. prescribed some antibiotic/cortisone drops to ease the inflammation and counter any bacteria. 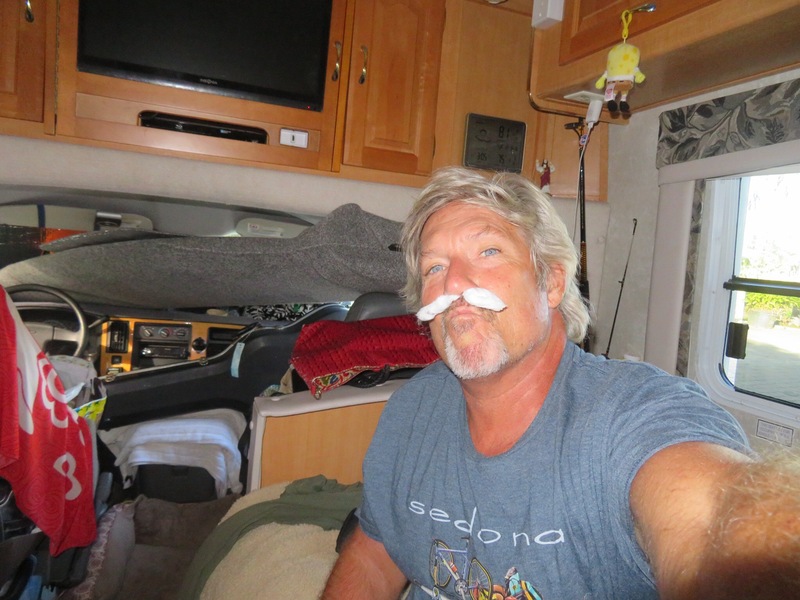 I am to do this for three days and then return Friday and hopefully, we can get in and clean out the ear and get back in the water. 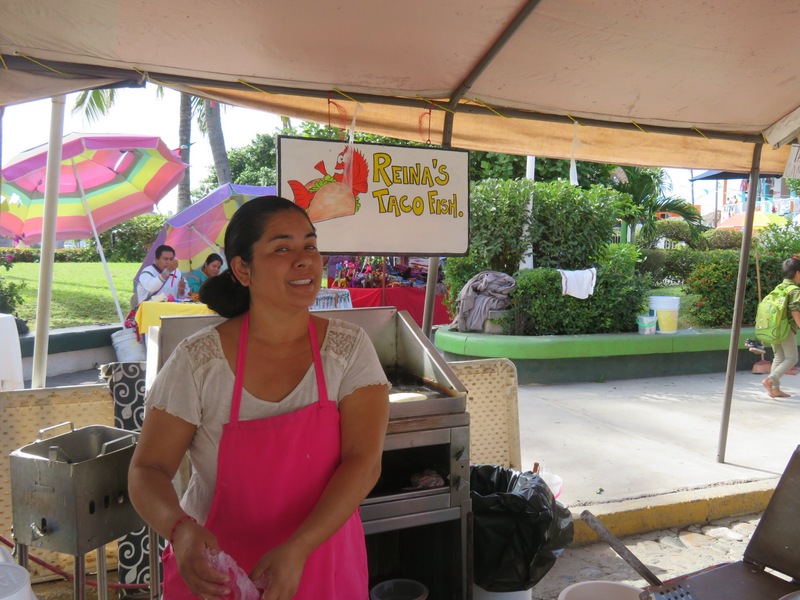 The consultation was 40 pesos – 2 bucks! The ear drops were 8, so for right around ten dollars, I was treated and on my way. We walked down the street towards the beach and PJ spotted a shop that sells the colorful banners she likes, so we stopped and bought a few and noticed that they also had the Chinese flying lanterns for a buck each so we got a few of those as well. 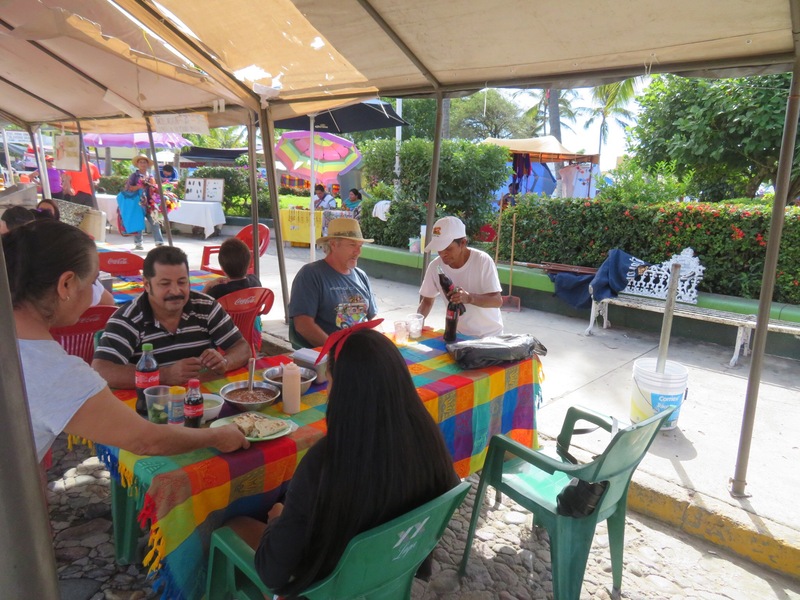 From there we continued on to the plazuela and ordered up some fish tacos at a street stall and kicked back at a table with a couple of strangers and had a tasty lunch. 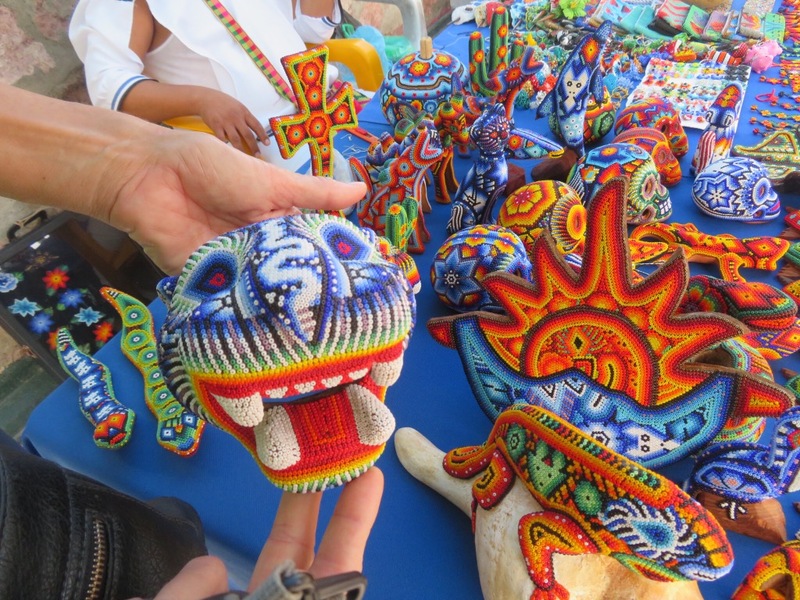 We wandered around the vendors stalls and had a look at a few Huichol artists at work placing the beads on their sculptures. Pretty cool stuff. Might have to add a beaded jaguar head to my collection of wooden jaguar heads that I’ve picked up in Oaxaca over the years. We walked down to the beach and had a look around. The big arroyo that runs from near our camp comes out at the ocean here. You can ride bikes down the dry river bed and avoid the cars making it an easy commute to the beach. We caught a taxi over to the Chedraui store, a grocery and general goods market like a wannabe Walmart. 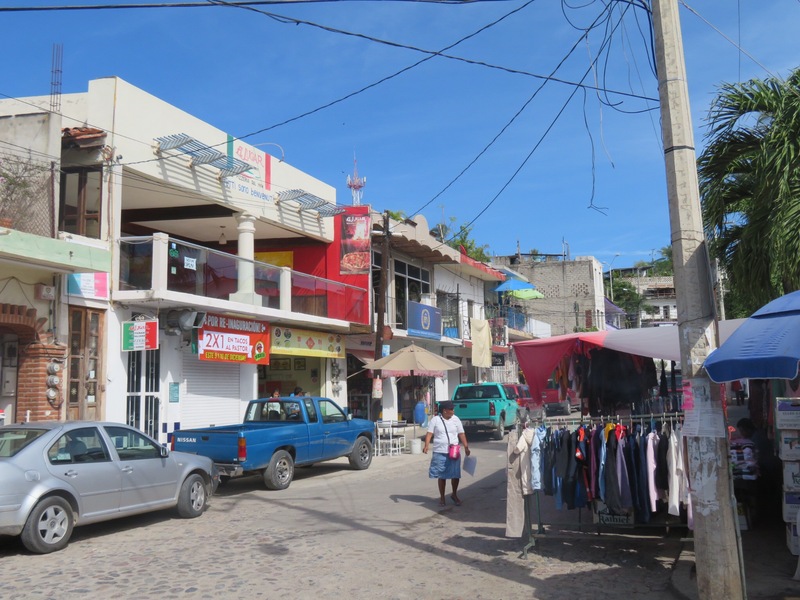 We picked up a week’s worth of groceries, lotions and such then caught a cab back to Los Arroyos Verdes. Unloaded our goods, walked the dogs and ate a small dinner. We both have headaches and aren’t feeling too spry. Put in my ear drops and laid low.